Passed away peacefully on Tuesday 4th December 2018. Dearly loved Husband of Marie. Loved Father and Father-in-law of Bruce & Debbie, and Graeme. Cherished Grandfather of Matthew, Natalie, James, and Andrew. Loved Brother of Patricia 'Pat' Condon, John 'Jack', Joseph 'Joe' (all dec'd), and Margaret 'Peggy' Selway. 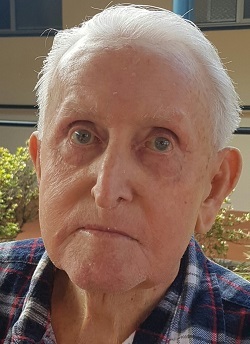 Family and Friends are warmly invited to attend Frank’s Graveside Funeral Service to be held at the Tweed Valley Lawn Cemetery, Eviron Road, Eviron, on Tuesday 11th December 2018, at 10.30am (NSW).